most off the rainbows have moved back down to the Lake but you will fined them in patches up the river so take your time and have a good look. Most fishermen are finding them in the deeper holes below the runs with the warmer weather moving in you will find fish starting to move up to the top this would be a good time to start using a few Dry flies though the day B/H Nymphs with a indicator will work well. 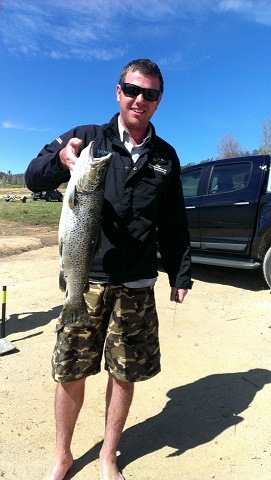 Lake Eucumbene:- he lake produced a few fish for some anglers but getting deep was essential from the reports received. There are heaps of stick caddis and snail moving out with the dropping water and if we can manage some cooler water temps the fish will be onto these quickly. Mudeyes have been hatching in numbers recently but not many fish have been on them due to the water temp. This is bound to change shortly and then the fishing will be excellent again. There are plenty of fat rainbows in the lake and when these fish turn onto the mudeyes there will be some fantastic evening fishing. Could even be better than last year. "jindy is fishing very well worth a look"
Lake Jindabyne:- Jindabyne reports have continued to improve with some great polaroiding. The fishing can still be hard but you may be able to get enough shots that you find a fish that eats. Weather may play a big role too in how hungry and active the fish are. The main thing is they are there. The lake is now going down but the fishing is still good with many fish are close to the shore with good numbers off browns taking woolly Buggers black,brown, and olive, B/H Nymphs are going well but let them drop for about 15 seconds. Best places to try in Eucumbene continue to be Seven Gates, Buckenderra, and the Dam wall. hi here is my 2.4 kg brown trout caught at the cobbity fishing comp a few weeks back at buckenderra caught him on scrub worms. Three of us fished the Yens bay area during the above dates, though fishing was slow we did manage three browns with the best being 2.35kg, also a number of well-conditioned rainbows, all fish were taken on worms as all power bait was refused, my mate Martin, only a third time fisho caught his first brown 1.75kg so he was wrapped. We also had a purist with us, totally dedicated fly boy who in the end took up bait as the fly was hard work in the windy conditions. Eucumbene trolling reports have been good with some nice rainbows showing up in many areas and a few browns too. The browns are not all in great condition but the rainbow quality have made up for this for many. Middilingbank has been good this past week and the bays around seven gates area continues to fish well. Jindabyne has produced few reports this week. There are still some good fish to be caught in Jindabyne but early starts are the key to catching them especially when the weather is super calm. Some nice fish taken trolling around the outside of the weed beds in many of the bays. Best areas to fish around, Poo bay down below the Jindabyne club, snowline caravan Park Kalkite and wast point. things have been a little slow so your lure selection is important. Blade lures would do well on the big browns as will the rainbow Rapala X-Raps and Jointed minnows are working as well. Still good reports of good fish have been court around the snowy arm and Kalkite. 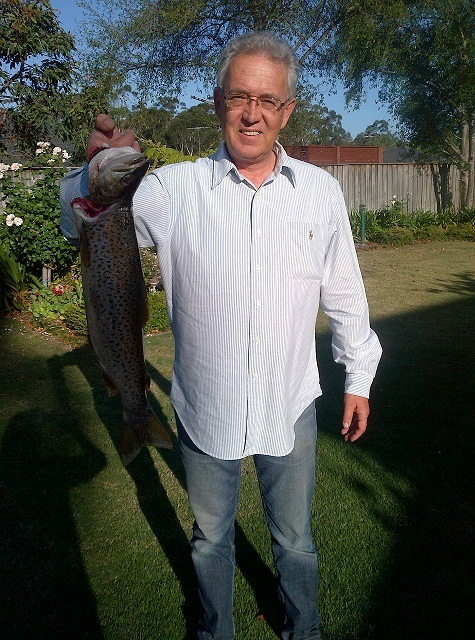 Reports that east Jindabyne is fishing very well.